If you delete your message attachments by accident or lost them duding an iOS updating, you can recover the message attachment from iTunes backup with professional iOS data recovery software iFonebox. We message each other a lot nowadays with our friends and family members, and we may attach pictures, audio or video files in the message if we prefer. Accidents always happen before you have any idea of it, just because you choose to update to the latest iOS update, all the attachment in your iMessage seem to be eradicated. We understand the frustration, so we would like to work out some way to get your missed messages attachment back. If you are sure your message attachments were lost in the process of iOS updating, the lost message attachments are definitely erased permanently from your iPhone or iPad, and there is no way to recover the lost iMessage attachments directly from your iPhone or iPad. Also, we are not suggesting you to restore your iPhone or iPad with a previous backup file, for this will result in data overlapping and permanent data eradicating. A secure way to recover your lost iMessage attachment is to export the messages attachments from your iTunes backup file selectively and independently, with third party iOS data recovery software iFonebox. As professional and specialized iOS data recovery tool, iFonebox is proficient at recovering lost contacts, notes, messages, messages attachments, whatsapp, whatsapp attachment, reminders, voice memos, calendars and safari bookmarks etc from iOS device as well as iTunes and iCloud backup. I am going to show you how to get back your missing iMessages attachments from iTunes backup file step by step. Step 1: Install and launch the full version of iFonebox. 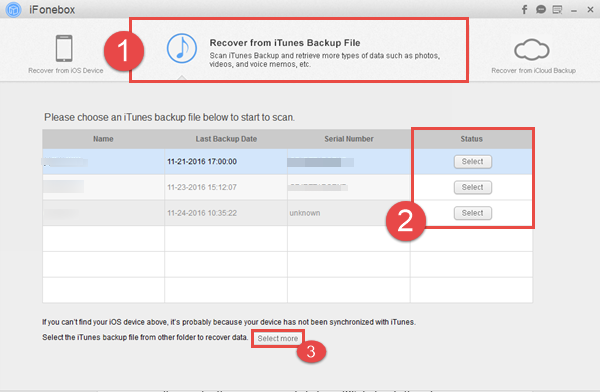 Click the tab of “Recover from iTunes Backup” to choose the recovery mode of recovering from your iTunes backup file. Then you will be prompted with an interface listing all the iTunes backup file on your computer. Note: If the iTunes backup file is not listed, it means your backup file may be saved anywhere else, or you didn’t sync your iPhone or iPad with this computer. You can try locating your iTunes backup file by hitting the button of “Select more” or change for another computer you have synced your iPhone or iPad with. 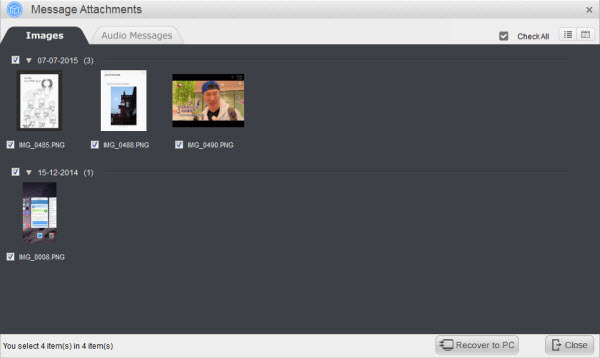 Step 2: Click on the icon for messages attachments to choose the data category of Messages Attachments to recover and export. Step 3: Take a preview at the exported attachments and then chose whatever you want to recover to your computer.